Jersey trounced Surrey-based Godalming Town 10-1 in the island side's first match since winning women's football gold at the Island Games. Midfielder Eve Watson starred with four of the goals, with Rosie Corbett and Wales international Jodie Botterill each scoring a brace. 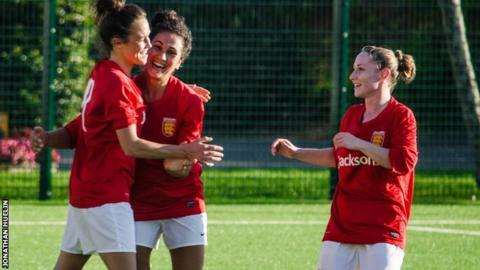 Kelly Hughes and Michelle Bichard also found the net, while Nicola Jefford scored for the visitors. "We played some good football," said Jersey boss Simon Petulla. "We had three or four of our best players missing today as well so it bodes well for the future. "Things are looking good for us and I just hope we can carry it on for the next two years." Jersey raced into a 3-0 lead inside 12 minutes at Springfield with strikes from Watson and Hughes followed by Corbett's header. Jefford pulled one back at the other end after indecision in the Jersey defence meant they failed to deal with a cross, but the gap was three goals again before half-time when Watson smashed in her second. Bichard's volley and skipper Botterill's goal just before the hour mark made it 6-1 to the hosts before Watson rounded the goalkeeper Kim Ketchell to complete her hat-trick. Botterill tapped in from close range for her second before Corbett netted Jersey's ninth and Watson made it double figures from close range late on. "It's very special [to score four] but you have to be in the right place at the right time and I was," Watson told BBC Radio Jersey. "We just really want more women to be interested, we're here to put the word out and show them what women's football is made of - it's not just about the men." Jersey's women are next in action on Sunday, 30 August against French side Union Sportive St Malo.